As one of only four girls in a family of 21 children, Lillian Dukes feels right at home with widgets, gadgets, engines and airplanes. ?Living with seventeen brothers sparked my competitiveness and cultivated a sense of self-confidence that pushed me to excel in what many considered a man?s career,? says Dukes. After earning a bachelor?s degree in electrical engineering and mathematics from Carnegie-Mellon University and a master?s degree from Villanova University, Dukes began a 20-year career in the aerospace industry. 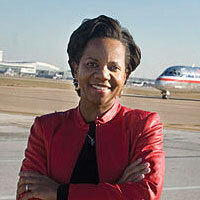 At American Airlines Inc., she negotiated an $8-million reimbursement credit for the premature failure of aircraft components. As vice president for maintenance at the low-cost carrier Independence Air, she led an initiative to modify 87 aircraft in 90 days. Currently, she is vice president of maintenance technical services for American Eagle Airlines, headquartered in Fort Worth, Texas. She says her relentless work ethic is inspired by a saying that author Rick Joyner penned in his book Leadership Management and the Five Essentials For Success. ?It does not matter what you do; if you do it with all your heart, day in and day out, you will inspire those around you and there is little that can prevent you from rising to the top.? Dukes recalls relying on this advice to help her through turbulent times. Prior to joining American Eagle, she served as vice president of maintenance for Independence Air, which at the time was a position held by only two females in the country. Dukes says that it was during these two years?when the airline went bankrupt, her mother and aunt passed and her father was hospitalized?that the very mettle of her being was tested. ?It?s not the challenges themselves that makes one strong, but how those challenges are faced and overcome that defines one?s strength and character,? she states.